It can be complicated for any business to keep up with all the cyberattacks and payment fraud going on around us. It’s particularly tough for small merchants that are vulnerable to attacks. PCI Security Standards are intended to increase payment data security, but they can be intimidating for a small merchant with limited resources. The PCI Security Standards Council (PCI SSC) announced a task force to help small businesses improve payment data security. The announcement was made at the National Restaurant Association (NRA) Show on May 19, 2015. The task force will be co-chaired by Barclaycard and the NRA to guide small merchants and simplify payment data security. The taskforce will provide best practices, simplified guidance, and market insight. Additional details are provided in the PCI SSC press release. Several RF processes provide lists from which items are picked or putaway one at a time. After the RF task is complete, the RF user is redirected to the list for the next item. This guides the RF user through the process with the intended path options selected by default. Mode A=”USER TELLS COMPUTER NEXT ITEM” – The RF device shows a list of the items to putaway. The RF user picks each item to load onto the transport device one after another until all items are loaded. Mode B=”COMPUTER TELLS USER NEXT ITEM” – The RF device tells the RF user the next item on the list to put away. The RF user finds the item to load onto the transport device one after another until all items are loaded. Using security privileges, you can allow your RF users to switch between both methods. To switch from Mode A to B, the “Bypass” button is used. To switch from Mode B to A, the “Go Back” button is used. The Mode used might be based on personal preference, or it might be based on how the inventory to be arranged or handled. When using Mode B =”Computer tells user next item,” an item may also be skipped, which moves the item to the end of the list. If the skipped item is found while the batch is still open, the item can be un-skipped, and putaway or received. Each of these RF operations has a separate security privilege to determine which mode a user/group will automatically be in, as well as a host of privileges to control which buttons or options they get in each operation. 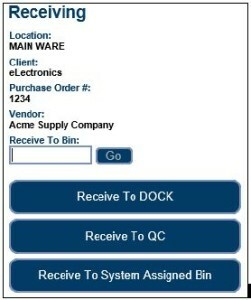 The InOrder RF Receiving functionality is useful when you’re expecting a purchase order to be filled, or when a surprise delivery is made to your dock. After purchase orders are created and printed, they are immediately available for RF receiving. 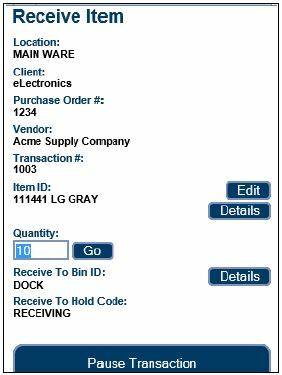 When material is delivered, any RF user (with the appropriate user permissions) may enter or lookup the purchase order with the RF device and begin the receiving process. 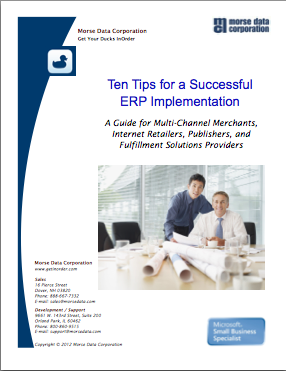 Multiple RF users may receive items for the same purchase order, which is useful for large purchase orders. RF users may leave their transaction while other RF users continue to receive items on the purchase order, or the user who started the transaction may pause it. 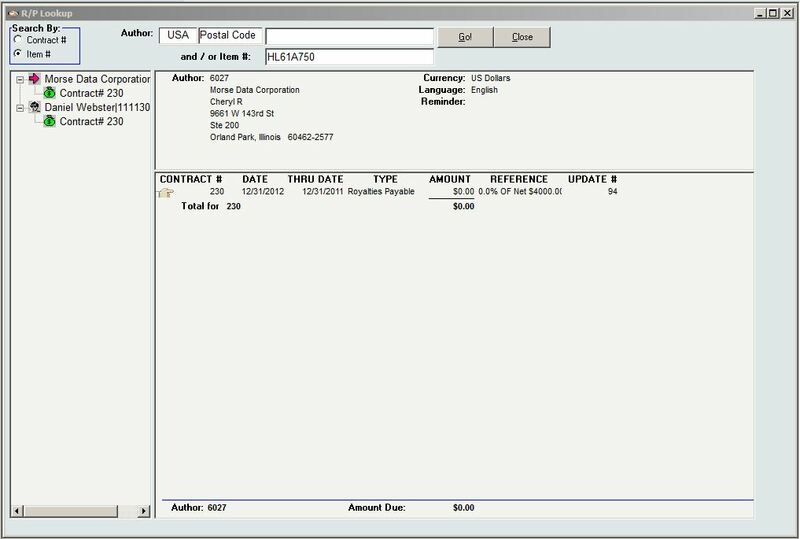 The RF user is guided through the receiving process to first select or lookup a purchase order. The RF User then selects a receiving bin location. 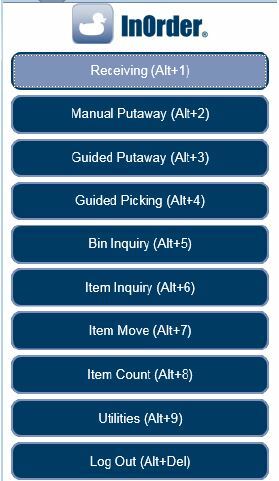 Buttons for common receiving bins and hold codes may be configured to represent your specific bins and codes. 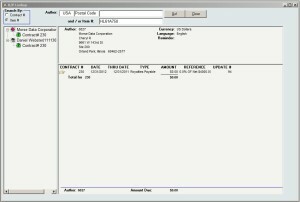 If there are existing, open receipt transactions for the same purchase order (these may be receipt transactions that were paused by the current user or a receipt transaction started by another RF user for a team receiving scenario), the InOrder RF user chooses whether to receive on an existing receipt transaction or start a new receipt transaction. The receiving section lists open purchase order line items. This section is useful for receiving small purchase orders (few line items). The open PO line items are presented and may be received one at a time via a button click and confirmation. If an item is damaged, a button directs the RF user to a new page to receive the PO line item as damaged. Options are also provided to manually receive the purchase order. This option is useful when receiving very large purchase orders with many line items. The item to receive is scanned and the quantity is entered. When you need to know which royalty contracts have a specific item, simply search Royalty Lookup. Click Item # in the Search By area.